This board enables you to connect original annunciators (e.g. bulbs) to the flight simulator via LAN. Plug and Play with JeeHell and ProSim (A320 and 737), others on request. The special of this board is that 220 mA for each of the 64 outputs are guaranteed. Even at full load (all outputs active) the voltage drop is very low so that also a light test is possible. Comparable products advertise 500 mA per output. However those old chips are not able to drive even 220 mA without a significant voltage drop. The result is that usually the lamps shine very dimmed if all outputs are on. 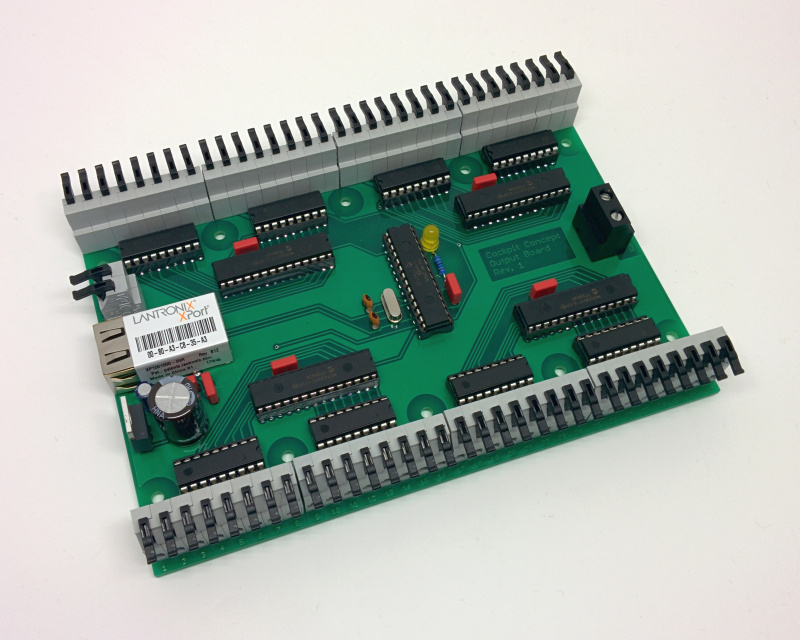 This board has been specifically developed to drive original 220 mA annunciators and uses modern chips as drivers. The board includes 64 sink type outputs. Connect the supply voltage (e.g. 5 V or 28 V) to one pin of the bulb. Connect the second pin of the bulb to the board. The board switches against ground. The drivers include clamp diodes so that also inductive loads can be switched. In case you want to switch inductive loads, connect the SUPPLY pin with the positive power supply (max. 50 V). Up to 220 mA per output (14 A overall load). You need an external 5 V power supply. Ready to ship in about one week.